This was posted on September 7, 2016 by Sarah Maxwell. 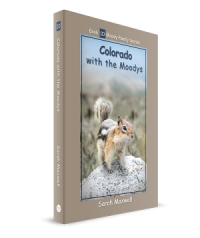 As many of you know, the Moodys went to Colorado in Book #10. So, since Sarah Maxwell, the Moodys, and the blog are all sort of mixed together, you’re going to love this e-mail we received from a mom. ME: Do you know what Sarah Maxwell and her family did at Colorado? MY FIRSTBORN: Visit Aunt Olga, of course. And oh! MR Delome. 🙂 said from a boy who read all the Moody books and kept asking when is the next one coming. Thanks. You’re always encouraging :). Cute!! When will your next book be out? Im so excited!!! I’m not sure. We’ll see! Thanks for your enthusiasm!